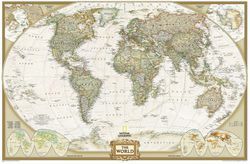 This Executive Style World Map is very popular world wall map because it looks like an old world map, but it's completely up to date! The muted brown tones provide a subtle map alternative to the more traditional pastels. This political world map also depicts the general features of the ocean floor and many place names. Features the Winkel Tripel projection showing the round earth on a flat sheet of paper while trying to minimize distortion. There are four sizes available for this world map: extra small (36"x24"), small (43"x30"), large (70"x48") and a beautiful three piece world map mural (110"x76").